The natural choice... For safe handwashing of virtually everything that needs cleaning. This unique liquid creme soap is the most versatile super-concentrated multi-purpose cleaner available. For best nontoxic and environmentally safe cleaning. Seafoam Dish Glow is a viscous, mild, free flowing discovery of unsurpassed quality without compromise for those who deserve the best. Lotionized for delicate skin with precious orange extract, seafoam dish glow looks - feels - smells like the finest of hand lotions, yet cleans superbly when dissolved in water. Highly concentrated for economy with rich long lasting soap suds to remove and suspend tough food residue and heavy grease. Nothing rinses more easily and completely. Use sparingly as is for excessively soiled dishes and utensils. 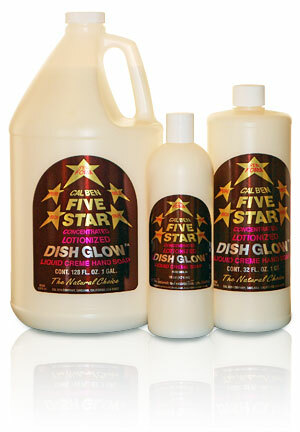 Approximately one or two tablespoons of Seafoam Dish Glow per gallon of water should suffice. Measure will depend on amount of water and degree and type of soil to be cleaned. May be diluted 1:1 with water for light duty cleaning. Waxed Floors: hardwood, linoleum, asphalt tile, vinyl asbestos, wax and no wax floors. All Purpose Cleaning: Use same measure as above for sponging and general washing down to wallpaper, painted walls tile, appliances. Liquid Pump Soap: For safe thorough cleansing of hands and body, refill your pump bottle with Seafoam Dish Glow diluted 1:1 with water. Delicate Fabrics, Woolens: just a squirt of Seafoam Dish Glow in cold or lukewarm water for all handwashables. Washing with seafoam dish glow extends the life of most garments by not weakening the tensile strength of the fabric. Car Wash: try 1 to 2 teaspoonfuls to one gallon of water for removal of dirt and road grime from the family car. Rinse well.